Director – Michael Anderson, Screenplay – Ralph Bettinson & William P. Templeton, Based on the Novel by George Orwell, Producer – N. Peter Rathvon, Photography (b&w) – C. Pennington Richards, Music – Malcolm Arnold, Special Effects – G. Blackwell, R. Langley & N. Warwick, Makeup – L.V. Clark, Art Direction – Terence Verity. Production Company – Holiday Films. It is the year 1984. After the nuclear war of 1965, the world has been divided into three superpowers, Oceania, Eurasia and Eastasia. Oceania, the former England, is at war with Eurasia. The populace live under the benevolent rule of Big Brother and telescreens everywhere monitor their activities. Winston Smith is a clerk with the Ministry of Truth whose job it is to alter newspaper articles and eliminate reference to people that have been labelled traitors. He believes that Julia, one of the fellow workers in the Outer Party, is following him. She then slips him a note saying that she loves him. The two embark on an illicit affair, kept secret from the eyes of the Party. Believing that his superior O’Connor is a fellow rebel, Winston trusts him with their secret, only to be arrested and taken to be tortured and broken. George Orwell’s Nineteen Eighty-Four (1949) is the single classic work of dystopian fiction. George Orwell was the literary pseudonym of Eric Blair (1903-50). Raised in a middle-class British family, Blair worked variously in jobs ranging from a schoolteacher to a policeman in Burma under British rule. As a writer, Orwell took the unique approach of going out living among the poor, observing every facet of life among the working classes of England from the doss houses of The Depression to the mines. This led to the formation of Blair’s socialist sympathies and the publication of non-fiction works such as Down and Out in Paris and London (1933) and The Road to Wigan Pier (1937) about his experiences. The formative event in Orwell’s life was his volunteering to fight in the Spanish Civil War in 1936, which left him bitterly disillusioned with the Communist cause as an effective expression of socialism. By the 1940s, Orwell had become a celebrated essayist. The two most famous works he is remembered for as a writer today are Animal Farm (1945), a book written in the guise of a children’s talking animal fable that is in fact a biting allegory for the failings of Communism under Joseph Stalin, and Nineteen Eighty-Four, which is possibly the most barbed and potent attack on the mindset of totalitarianism ever written. The influence of Nineteen Eighty-Four is immeasurable. It has sold millions of copies. Terms that Orwell devised in the book such as Newspeak, Big Brother, Thought Police, Thoughtcrime and telescreen have gone on into popular parlance, while the term ‘Orwellian’ has been coined to describe an all-pervasive authoritarian society. (Orwell is also believed to be the person who devised the term ‘Cold War’ in one of his essays). The name Big Brother even lent itself to the reality tv show Big Brother (1999– ), which comes in differing international versions, in which various contestants are in a series of elimination rounds in a house that has been wired with cameras everywhere. There have been numerous songs and albums referencing Orwell from artists such as David Bowie, Siouxsie and the Banshees, Radiohead and Muse, among others. 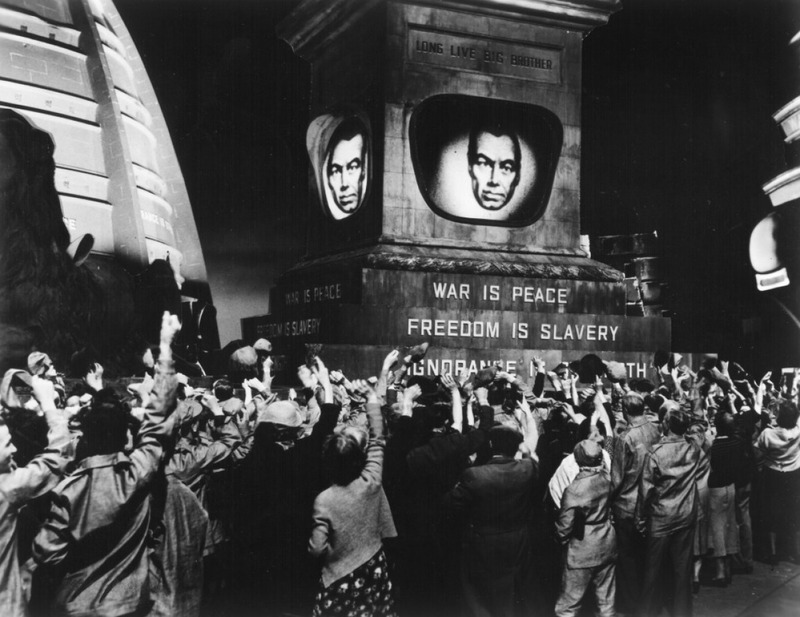 There have been stage and opera adaptations of the book, while modern films such as Terry Gilliam’s dark satire Brazil (1985) and much of Equilibrium (2002) draw heavily from Orwell’s imagery. 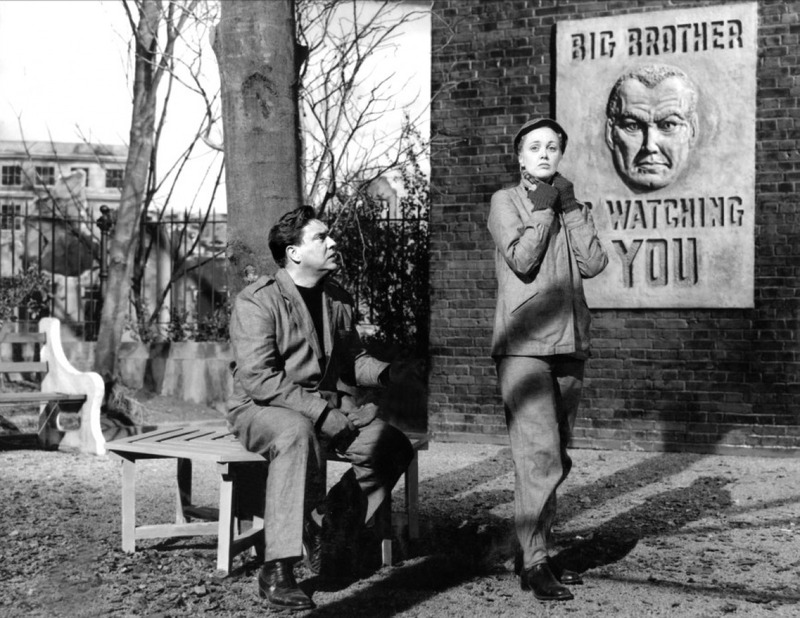 Nineteen Eighty-Four was filmed prior to this, first in 1953 as a 60 minute episode of the US tv series Studio One (1948-58) starring Eddie Albert as Winston and Lorne Greene as O’Brien and in particular with Nineteen Eighty-Four (1954), a celebrated tv play broadcast live on the BBC written by Nigel Kneale and starring Peter Cushing as Winston Smith and Andre Morell as O’Brien. The success of this led to the 1956 film here. This film version has been long out of circulation due to Orwell’s widow Sonia Brownell withdrawing the rights after the original copyright expired and one is only able to find bootleg copies on the internet and YouTube. An excellent, much more authentic film version was later conducted by Michael Radford with Nineteen Eighty-Four (1984), which was designed in a dreary post-War alternate world, and featured John Hurt as Winston Smith, Suzanna Hamilton as Julia and Richard Burton as O’Brien. When it came to the screen here, 1984 befell director Michael Anderson. Anderson gained a reasonable presence in the 1950s with hits like The Dam Busters (1955) and an adaptation of Jules Verne’s Around the World in Eighty Days (1956), which came out seven months after 1984 and won that year’s Academy Award for Best Picture. Elsewhere though, Anderson has laid a trail of devastation through genre material with the likes of Doc Savage: The Man of Bronze (1975), Logan’s Run (1976), Second Time Lucky (1984) and The Martian Chronicles (1980), among others, all of which fall flat with his pedestrian and frequently leaden heavy-handedness. (See bottom of the page for Michael Anderson’s other genre works). The first change to the book you note is that the film has gained an introductory prologue that locates the future of Oceania, Eurasia etc as one that emerged in the aftermath of a nuclear war. Orwell never needed that device. This now locates 1984 within the context of the great 1950s era of nuclear age anxieties along with the numerous atomically revived dinosaur and giant bug films of the period. 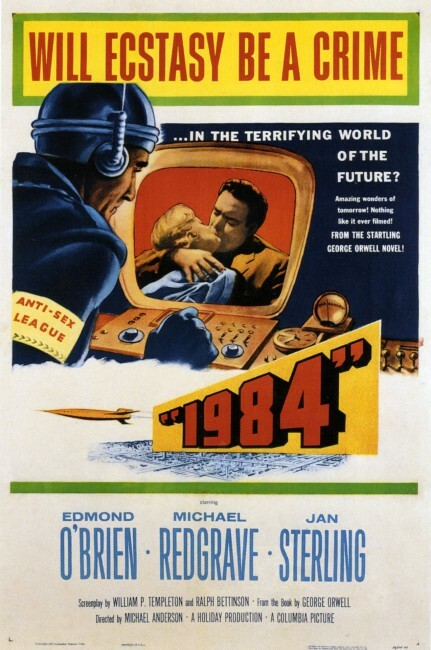 Certainly, the 1956 version of 1984 has an advantage that the 1984 film lacked (even despite the latter setting itself in a retro 1940s period and shooting during the dates of the year that are stated in Winston Smith’s diary) – namely in that it comes out only seven years after Orwell wrote the book. Thus it is immediately a work about the future that comes steeped in the same mindset of the era in which Orwell was writing. Aspects that we see like the wartime shortages or the populace running for shelter as air raid sirens sound out were all things that audiences of the day would have been intimately familiar with in the aftermath of World War II. And as aspects of Orwell’s story come in, the film starts to look promising (despite the negative reputation it has with almost all genre historians who have seen it). The scenes with Edmond O’Brien’s Winston Smith returning to his apartment and kicking the diary he has purchased in with his foot so as not to be seen by the telescreen, then hiding it inside his paperwork and sitting down to boldly write “Down with Big Brother” or with neighbour Donald Pleasance and his obnoxious kid knocking at the door to accuse O’Brien of being a spy all have a flavour authentic to the book. Or the scenes visiting Charrington (David Kossof)’s antique store and the sense that the film creates of nostalgia for a past that has been ruthlessly obliterated by the state. Of course, Michael Anderson being the director he is fails to sustain this. 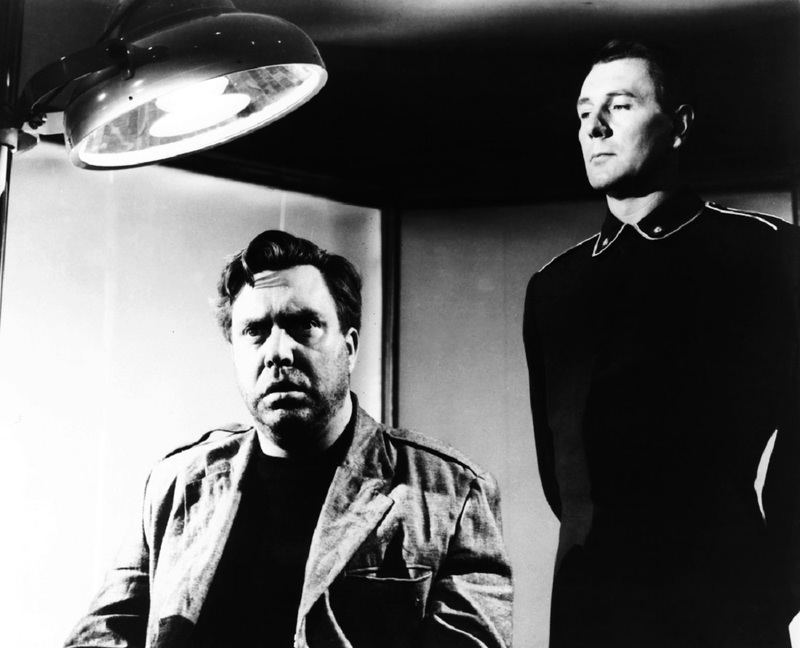 The problem with the casting of pudgy Edmond O’Brien is that he (and the way the role is written) makes for a rather thick Winston Smith. You have no sympathy for his ability to think like a subversive when he makes the abrupt decision that his boss Michael Redgrave can be trusted and he and Julia go and confess all to him. The other aspect is that Anderson gives the romance with Julia a dull perfunctoriness that never comes to life. Jan Sterling gives a performance where all that she is is the standard romantic foil for a film, never anything that suggests an insurrectionary who seduces Winston. On the plus side, the film has Michael Redgrave who makes for a marvellously cast O’Brien (who has here been retitled O’Connor so as presumably not to cause confusion with the film’s star Edmond O’Brien). Redgrave plays cold and supercilious, perfectly personifying emotionlessly efficient bureaucracy as he iterates ideas like Newspeak or the scene in which he denies the existence of the photo of the traitor that Winston brings to him. Michael Redgrave makes the scenes with O’Brien/O’Connor’s brainwashing and breaking of Winston work – even if Michael Anderson fails completely when it comes to the scene where Winston faces Room 101 and his greatest fear (after only about five seconds of being in a room of rats, he falls into O’Brien’s arms broken). These scenes work okay but in all cases Michael Radford did a far better job of them in the 1984 film version. There the period setting was bleak and desolate, Orwell’s dialogue superbly nuanced and above all John Hurt, Suzanna Hamilton and especially Richard Burton, who was on magnificent form as O’Brien, made the characters come to life in every way, totally overshadowing anything that Michael Anderson does here. The only other Orwell book of fantastic to have been filmed is Animal Farm (1945), a savage indictment of the ideological failings and hypocrisy of the Russian Revolution under Josef Stalin written in terms of a talking animals fable. This was disappointingly filmed twice as the animated Animal Farm (1954) and as the live-action Animal Farm (1999). Michael Anderson’s other genre films include:- The Shoes of the Fisherman (1968), a political thriller concerning a near-future Pope; Doc Savage, The Man of Bronze (1975) based on the pulp hero; the dystopian sf film Logan’s Run (1976); the killer whale film Orca (1977); the psycho-thriller Dominique (1978); the tv mini-series adaptation of Ray Bradbury’s The Martian Chronicles (1980); the thriller Bells/Murder by Phone/The Calling (1981) about killer telephone calls; the excruciating Adam and Eve softcore comedy Second Time Lucky (1984), one of the worst films ever made; the John Varley time travel film Millennium (1989); the tv movie remake of 20,000 Leagues Under the Sea (1997); and The New Adventures of Pinocchio (1999).